A sense of place emanates from direct personal lived experiences that is shaped consciously and subconsciously over time (Bates 2018; Chawla 2004). From a phenomenological viewpoint, this suggests that a people-place connection is formed as one enacts their lived experiences (Gendlin 2004). Building connectedness of this kind not only benefits an individual’s sense of self and others. It also encourages a sense of respect, and direction to care for the natural world (Mannion and Lynch 2016). With much of children’s lives spent in educational settings, immersive outdoor experiences in school settings make critical contributions to forming place connections (Mannion and Lynch 2016; Wattchow and Brown 2011). Australian Curriculum, Assessment and Reporting Authority. (2018). The cross-curriculum priorities. 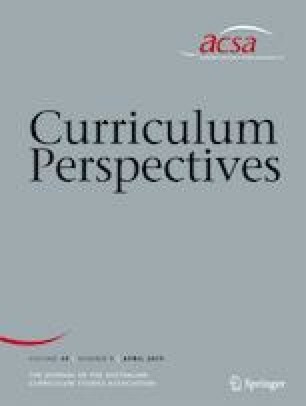 Retrieved from https://www.australiancurriculum.edu.au/f-10-curriculum/cross-curriculum-priorities/aboriginal-and-torres-strait-islander-histories-and-cultures/. Accessed Feb 2018.